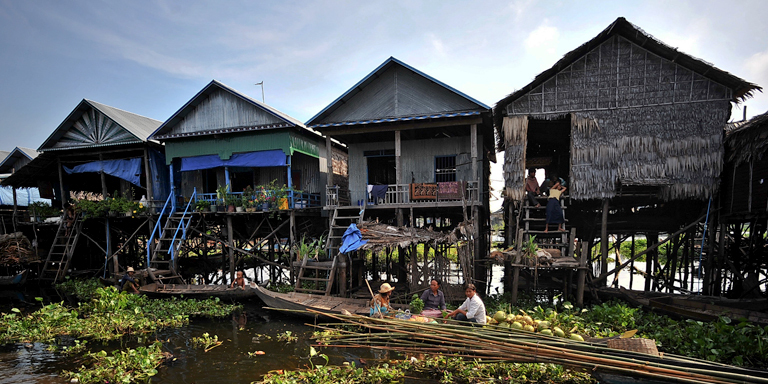 Stilt houses in Kampong Phluk, Siem Reap Province, Cambodia. Southeast Asia contains some of the world’s most most climate change-vulnerable countries. Photo credit: ADB. Southeast Asia is home to some of the most climate change-vulnerable countries in the world. It is imperative that ASEAN benefits from COP24. The United Nations Climate Change Conference in Katowice, Poland, (COP24) has been seen by many as the most important climate negotiation since 2015, when 196 countries agreed on a vision for a climate-neutral future by adopting the landmark Paris Agreement. Termed “Paris 2.0,” the Katowice talks are an important moment in international climate-change negotiations, as they work toward finalizing the implementation guidelines of the Paris Agreement. This puts the Paris targets into practice and establishes a process for each country to present their plans, review their commitments and implementation of policies, and assess whether governments are collectively on track for the Paris Agreement goals. The stakes for ASEAN in moving the Paris Agreement forward are higher than ever before. COP24 takes place in the wake of the Intergovernmental Panel on Climate Change’s (IPCC) Special Report on 1.5 degrees Celsius, which delivered an unequivocal message that Southeast Asia needs dramatic changes across multiple sectors in the coming decade to limit global temperature rise to the threshold laid out in the Paris Agreement. Coupled with rising public awareness of the increasing signs of climate impacts—from last year’s devastating droughts in Thailand to damaging floods in the Lao People’s Democratic Republic and to ferocious typhoons in the Philippines—this should provide impetus for ASEAN leaders to take decisive action. Southeast Asia is home to some of the most climate change-vulnerable countries in the world, and it is, hence, imperative that ASEAN pushes for the strongest possible outcome from COP24. Fortunately, the IPCC report also highlighted the many opportunities for climate action that can also boost development. These messages reinforce findings from the 2018 report of the Global Commission on the Economy and Climate and the 2017 report on low-carbon finance from the Economic Research Institute for ASEAN and East Asia (ERIA), showing that climate action can generate $26 trillion in economic benefits globally and more than $7 trillion regionally by 2030. There is no longer a question of whether ASEAN should choose economic growth or climate action: It can have both. At COP24, ASEAN member states can demonstrate their advantages and commitment to achieving the vision of the Paris Agreement by delivering four key things to the international community: (1) advocate and agree for detailed guidelines on how the agreement will be implemented, often quoted as the Paris Rulebook; (2) send a clear signal that ASEAN member states will strengthen their Paris commitments by 2020; (3) express confidence that enough finance, both public and private, will be made available to support a low-carbon and climate-resilient transition by 2030; and (4) share its experience on climate-smart regional development through institutional connectivity, physical connectivity and people-to-people connectivity. First, the Paris Rulebook is not going to be a simple document of rules or a roadmap. It will be the adoption of a set of guiding principles for all countries to follow in implementing their Paris commitments or Nationally Determined Contributions and beyond. It is essential to mobilizing action on the ground and ensuring ASEAN member states are on track to achieve their individual and collective commitments. It will spell out how ASEAN member states will communicate their policies, strategies and plans; how they will regularly track and report on individual efforts; how they will assess progress; and how they will strengthen their efforts and scale up investment over time. The rulebook will need to find the right balance between common approaches for all countries, with national discretion and flexibility for adopting the 2025 ASEAN community vision. Second, the Paris Agreement laid out a process where countries will strengthen their climate action plans every five years. We are in the midst of the first of those five-year cycles. At COP24, ASEAN countries need to send a very clear signal to the international community, reaffirming that they will strengthen their national climate commitments by 2020, with or without international support. This is in line with the ASEAN Economic Community and ASEAN Socio-Cultural Community blueprints. The final decision to be agreed on by the countries at COP24 should reaffirm the importance of the 2020 timeline adopted in Paris. These updated commitments should build on the urgency and opportunities underscored by the IPCC and ERIA reports. The ASEAN deliverables in Katowice could also encourage other developing countries and regional groupings to intensify their national consultations on their climate plans and stress the importance of regional cooperation to pursue stronger goals. Third, the availability of finance and access to technologies continues to be essential for ASEAN to fulfill the Paris commitments. COP24 needs to build confidence that ASEAN countries, especially those most vulnerable to climate risks, will have international support to invest in climate solutions and adapt to climate impacts. One of the most significant mechanisms for channeling international financial support is the Green Climate Fund. With its new replenishment of $1 billion, it can kick-start more adaptation projects in support of the ASEAN Agreement on Disaster Management and Emergency Response. ASEAN should urge developed countries to further replenish not only the Green Climate Fund but other climate funds operated by other multilateral financial institutions like the World Bank and the Asian Development Bank as well. These institutions have the potential to crowd in more private capital, in the order of 1:10. Finally, not everything taking place at COP24 will involve solely ASEAN governments. The dialogue process and side events will bring together ministers, business leaders, city leaders, members of academia and community-based organizations to discuss concrete solutions being pursued across many sectors. ASEAN member states should highlight the roles that specialized regional-connectivity organizations can play—such as the ASEAN Centre for Biodiversity in developing new business models, the ASEAN Centre for Energy in sharing the best policy practices, the ERIA in generating new knowledge on regional cooperation and a wide range of other actors in combating climate change in a coordinated way in the region—to illustrate how it can be done and to inspire the international community. What ASEAN member states say individually and commit to collectively in Poland determined the extent and nature of climate efforts for years to come. It either brings the world closer to meeting the Paris Agreement goal of limiting temperature rise to 1.5 to 2 degrees Celsius or pushes action further down the road—making it harder and more expensive to respond to later. In 2017, the economic costs of climate-related disasters hit a record $320 billion globally. By 2050, climate change is estimated to reduce annual GDP of ASEAN by up to 6 six percent. ASEAN leaders cannot afford to ignore these numbers. Venkatachalam Anbumozhi is a senior economist at the Economic Research Institute for ASEAN and East Asia (ERIA). Previously he worked at the Asian Development Bank Institute in Tokyo. He has written books, research articles, and project reports on natural resource management, climate-friendly infrastructure design, and private-sector participation in green growth. He was a member of the APEC Expert Panel on Green Climate Finance and the ASEAN panel for promoting climate-resilient growth.